Trapped by torrential rain in a Sidmouth bookshop last weekend I stumbled upon a gem of a book. We didn’t entirely escape the rain, which was dripping ominously through a patch in the ceiling onto a spinner of children’s stories below. I can’t help feeling a little bit nervous for small bookshops like these. The relentless march of Amazon has put paid to many, including both in our town, so times much be tough. 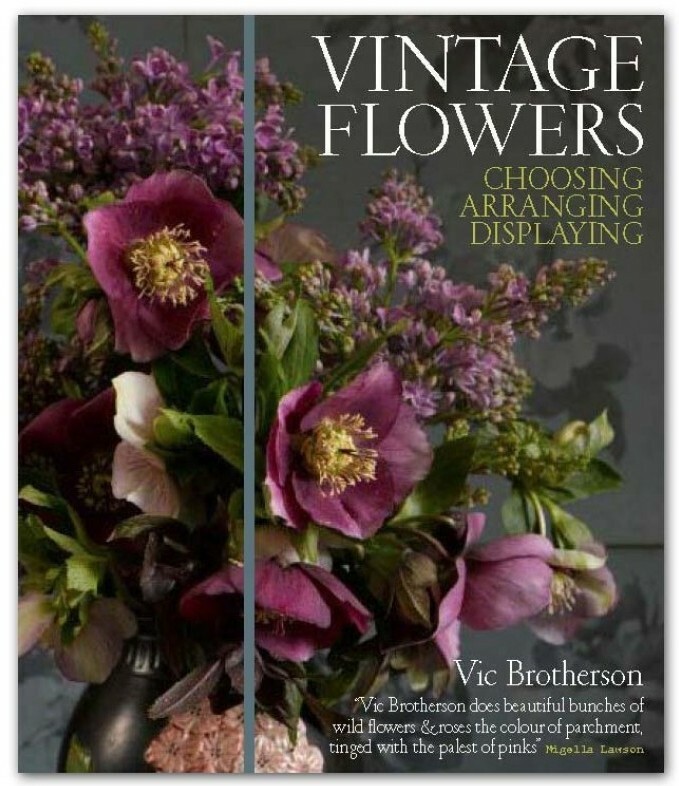 However, what Amazon can’t do is grab you with unexpected delights such as Vic Brotherson’s “Vintage Flowers”. Found languishing on the bottom shelf, this book is crammed full of beautiful photography by Catherine Gratwicke and helpful, step-by-step advice. Vic’s words have already encouraged me to stop just plonking supermarket flowers into cylinder shaped vases and actually put some thought into arranging them nicely. In fairness to the bookshop, and resisting the urge to make a note and buy it on-line when I got home, I made my purchase there and then and we stumbled back out into the ceaseless deluge. 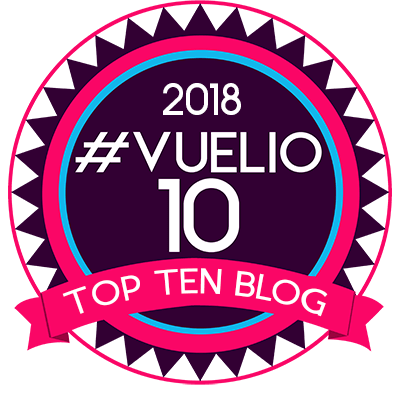 Vic Brotherson is the owner of Scarlet and Violet, a florist in Kensal Rise, London. Her style of flower arranging is my style: natural, loosely structured, unpretentious and affording flowers the opportunity to steal the show. It’s no surprise that Kate Moss made a beeline to Scarlet and Violet for her wedding flowers last summer. 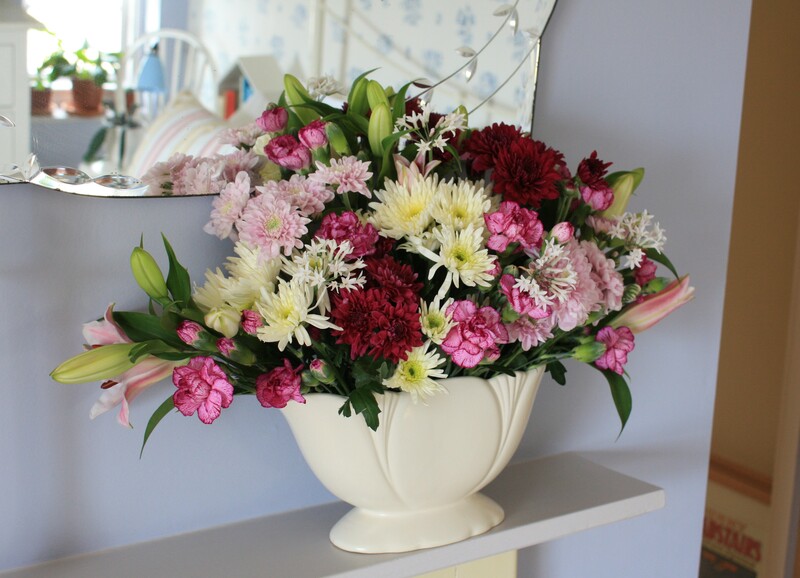 Vic’s inventive use of different containers, often inexpensive things one can find at car boot sales or in charity shops, is truly inspiring – not a boring plain-glass vase in sight. There are very few rules to achieving her signature style, but the results are joyful, vibrant and uplifting. I love her use of velvet coloured dahlias (happily back in vogue), parrot tulips, antique coloured hydrageas (she’d surely love “Merveille Sanguine”? ), Ranunculus, roses and peonies. This revelation will probably result in a flurry of vase purchasing, a problem in our house because our cupboards are already full. Ignoring that completely, at a car boot sale on Sunday I was lucky enough to pick up a 1950’s Dartmouth Pottery mantel vase for £1, complete with the original wiring. Today I have had my first attempt at filling it, for less than £10 courtesy of a certain supermarket, adding 4 precious stems of white Tulbaghia from the garden. It certainly isn’t up to Vic’s standards, but just doing it has given me a lot of pleasure and a yearning for the sort of garden where flowers can be grown for the sole purpose of cutting. 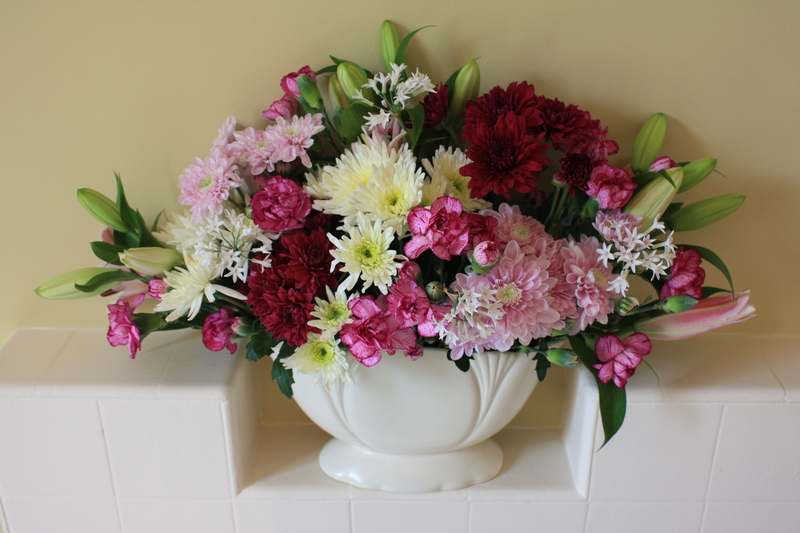 This is where supermarket flowers fall short – limited variety and no foliage to work with. Oh for a few stems of Alchemilla! Now I feel spurred on to try out more ideas before the summer is finally over. Vintage Flowers also offers some gorgeous ideas for Christmas, which I am dying to try out (I know, I have mentioned the C word, sorry!). Even if you don’t like flower arranging, go out and buy this beautiful book – the pictures alone will be reward enough for your hard-earned pennies. How lovely to see that gem of a vase put to good use, she looks very pleased to be with that splendid and quite correct fireplace. Constance Spry would be pleased to see such fine work. Thank you! The flowers are still going strong. They seem to last a lot better with the stems that short. Very chuffed with my vase and thank you for helping me find it.